The CharCone is a versatile product that can perform many useful functions. Designed primarily to make biochar (charcoal) it can also be used as a grill, fire pit, and smokeless burn barrel. It follows a functional design that has been used for over 1,000 years and refined by modern research and technology. Making charcoal to enrich the soil and to address the climate crisis (instead of making it for fuel) is not just a good idea, it is a global imperative. The CharCone enables almost anyone to participate in the solution of a massively complex problem in a very simple, personal way. 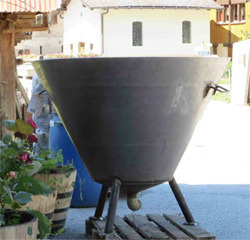 The CharCone is a “cone kiln” which seems to have origins in Japan but was recently researched, recreated, and popularized by Kelpie Wilson (Backyard Biochar). Her work has been central in developing different product variations and communicating the ideas and contributions of others. Inspired by Kelpie’s efforts, the Ithaka Institute expanded and refined the original design. Their Kon-Tiki flame curtain biochar kiln is what, in turn, inspired us. Looking for a practical, affordable way to make biochar from local feedstock, we were convinced when we saw the Kon-Tiki presented that it was the solution. 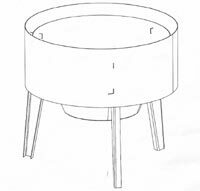 Since we (at SpitJack) had manufacturing resources and capability, we were able to and create a design that incorporated the core functions of the cone kiln concept into a versatile consumer product. By focusing on a common everyday need (the management and processing of yard waste), we found a widespread market and feedstock source. By building in and emphasizing cooking options and accessories, we extended its use beyond that of charcoal production, critical to creating a wider consumer appeal and acceptance. The CharCone is designed primarily as a device to create charcoal intended for sequestration. 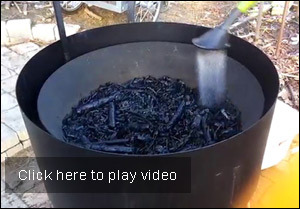 The charcoal produced can be used for other purposes (cooking or heating fuel), but the recommended method and techniques used to make charcoal in the CharCone are optimized for biochar. If you are making charcoal specifically for other uses, please let us know and we can advise you. Details and step-by-step instructions on how to make charcoal in the CharCone are available here. Details on biochar and charcoal sequestration are available here. While you are burning your brush and making some charcoal, you can use the heat created to grill some food. 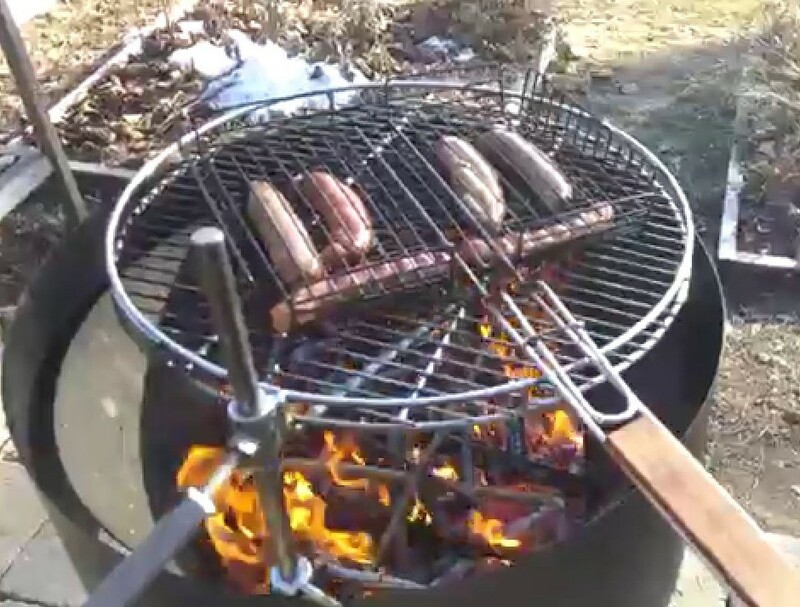 The high heat of the fire and the need to continually add feedstock makes traditional grilling impractical (and dangerous) but with the optional adjustable swing-out grill, it is easy and gives great results. When we were designing the CharCone, we realized after considering many factors (such as shipping box limits, burn time, etc.) that we were very close to the size of a conventional kettle grill. After a few tweaks, we were able to make it very adaptable to existing parts and products made for any 22″ kettle grill (e.g.Weber). So, with a simple set of brackets, you can transform the CharCone into a kettle style grill. The kettle grill cover will fit nicely in the cone as well. In fact, the bigger depth of the CharCone gives you the option of using it like a ceramic grill (e.g. Big Green Egg). Go here for details and more grilling options for the CharCone. Just using the CharCone in its primary function as a charcoal kiln qualifies it as a “fire pit type activity”. If there are passive participants, and they are there to enjoy the ambiance of the fire, then for them it is a fire pit and not a charcoal kiln. Even for those “working” the fire it can be thought of as such. Semantics aside, a more precise definition of a fire pit could be a “smaller, more controlled bonfire” and the CharCone fire would certainly fit that description. Most fire pits, however, are lower, closer to the ground. So we suggest that if you want to make a more “authentic” fire pit experience, remove the legs, secure the CharCone on a couple of layers of bricks and don’t worry so much about smoke, technique, and making so much charcoal. Have fun! 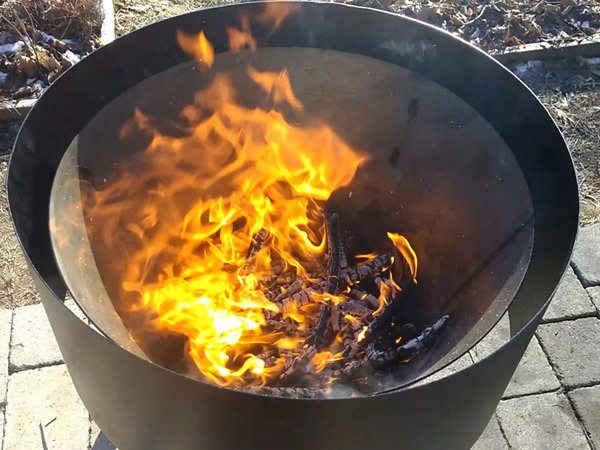 Burn barrel is usually just a fancy name for a cheap incinerator – for example, an old oil drum that you can use to burn papers and brush and “whatever”. If not constructed well it can be a very dirty and smoky fire which is why it is illegal in most places. Most burn barrels are full of holes that draw air (oxygen) into the fire to keep it hot enough to burn efficiently. Even so, because of the extra oxygen, everything will burn quickly to ash (incinerate), and you will not make any charcoal (and lose all the carbon value of your feedstock). Burning other things (e.g. clean cardboard, paper, bones) along with the recommended feedstock can be OK when using the CharCone. Just be sure that the fire and smoke stay under control. Depending on what you burned you might have more ash and more contaminants in your charcoal than normal. Best not to use this type of char for garden soil sequestration. Instead, you can just put it in with your trash. It will actually help the landfill by controlling odors and leaching out harmful contaminants. The CharCone has a few optional accessories available that extend the use of the basic product. For a list and more detailed information on all accessories and related products, please visit our online store. Garden hose adapter assembly – A three part brass hose fitting assembly that converts the drain (3/4″ standard male pipe threads) to a 3/4″ (standard) female hose connector. A screw in plug and silicone (high temp) washer is included so the fitting can be left on during burns. More information in our store. Weber grill adapter bracket sets – A set of three custom brackets made to fit on the rim of the cone and serve as an adapter for a Weber 22″ grill grate set. These brackets will support both the charcoal (lower) grate and the larger cooking grate. In this way, you can transform the CharCone into a familiar cooking system using your existing grill parts (including the lid!). More information in our store. Auspit Rotisserie – There is a port built into one of the leg brackets on the cone that allows for the addition of accessories. It was designed primarily for the Auspit a third party rotisserie system that works perfectly with the CharCone. Grill Pan (long handle) – Although made as a chestnut roasting pan, this product is perfect for cooking over the fire of the CharCone. The long handle sure comes in handy. More information in our store. PartyQ Temperature Controller – This helps maintain a constant temperature when using the CharCone as a low-temperature smoker. Covers – Two covers are available for the CharCone – 1) an aluminum lid that fits over the cone and can be used for grilling or smoking and also to keep water out of the cone during storage, and 2) a polyvinyl cover that protects the entire unit fro the elements. More related products and accessories can be seen in our online store. Total weight with shield: 64 lbs. If you would like to purchase a CharCone 24, follow this link to our online store. The CharCone can be shipped anywhere worldwide. It is shipped UPS (any available service) and shipping in the continental US is between $35-65. Please contact us for shipping details and other questions about our products.